As the title suggests Rhodium (Rh) is a rare metal, the silvery corrosive resistant metal is used mostly in catalysts to clean emissions and pollutants from cars. The price of Rh has certainly been on a roller coaster ride these last 40 years drifting from enormous overvaluations to extreme undervaluation’s, where in fact we presently find ourselves today ! The metal competes with platinum, despite the fact that platinum mine production is 12 times larger than rhodium production. It is generally produced as a by-product of platinum and nickel mining; there are only about 10 mines in the world that can produce it. As Rh is so rare it cannot respond to changes in demand easily and therefore the price is driven by simple supply and demand factors. The most commonly used metals in a catalytic converter are platinum (Pt), Rhodium (Rh) and Palladium (Pd). Rhodium - along with platinum, palladium, ruthenium, iridium, and osmium - is part of a group of elements referred to as the platinum group metals (PGMs) or platinum group elements (PGEs). Platinum group metals have similar physical and chemical properties, but rhodium is the rarest. Rhodium’s markets are autocatalysts where 80 percent of metal is consumed, with chemicals using 8 percent, glass 3 percent, the electrical industry 0.5 percent and other industries using around 9 percent. Global demand for rhodium is poised to exceed output by the most in three decades as carmakers and chemical companies snap up supplies near the lowest prices in eleven years (not seen since 2004). With Rh paper prices trading below US$650 (as of writing 3rd Jan 2016) makes this investment opportunity rather more compelling (or should we say irresistible) than at any time in recent history back to 1970. In fact inflation adjusted US$, Rhodium is priced at the cheapest level in over 45 years of data going back to 1970 (today's price is less than 50% of the price in 1970) ! For such a rare precious metal this is an extreme investment opportunity. Historical revaluations leading into spikes of Rh coming from deep undervaluations have been of the order of a minimum 4 times (400%) up to over 20 times (2000%) appreciation. Rhodium competes directly with platinum in the car market, presently Rh is trading at a 30% discount to Platinum as of January 2016 and this price differential between these metals will strongly influence demand for rhodium considering its extreme cost advantage at this time. The strike in South Africa (Jan 2014 to June 2014) caused the prices of rhodium to rise in fact, the price of rhodium has been higher than platinum at several points since August 2014. Consequently, whilst demand for platinum has fallen by 5,000 ounces in 2015, down 0.06% y-o-y, demand for rhodium has fallen by 8,000 ounces, down 0.8% y-o-y due to its price disadvantage, now that cost disadvantage has completely reversed ! From a $440 low in January 2004, prices ballooned near 23-fold to more than $10,000 over five years as industrial users hoarded the metal amid concern that South African mine supply would fall. Platinum reached a record $2,300 in 2008 (Rh was 4 times more expensive than Platinum) and palladium reached a six-year high. 'Manufacturers started using less rhodium in favour of other metals and increased recycling to cut costs, boosting producer-held inventories. Supply beat demand by a combined 488,000 ounces in four years through 2011', Johnson Matthey estimates. Rhodium hasn’t had enough time for less supply to catch up with the demand growth in a way that it will drive prices higher as of yet, however that story has changed considerably. Was this spike unusual ? 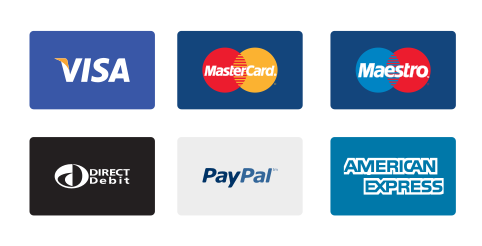 A rally from US$ 200 to over US$ 800, a 4 fold increase. 'Rhodium may be too small a market for some investors. About 134 ounces of gold will be mined for every one ounce of rhodium in 2014', Morgan Stanley estimates, and total output of rhodium will be just 12 percent of platinum production. 'Deutsche Bank’s rhodium-backed exchange-traded products, begun in 2011, have holdings equal to 11 percent of annual supply, compared with 25 percent for global palladium ETPs and 34 percent for platinum funds', according to bank data and figures compiled by Bloomberg. There just is not a large inventory of rhodium sitting around ! 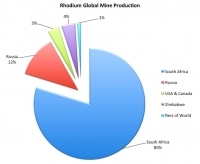 There are less than ten significant rhodium producing mines in the world, most of which are located in South Africa, which supplies over 80% of the world's demand for rhodium. Historical averages Rh has been over twice as expensive as gold and 154 times more than silver. Annual production of rhodium is extremely limited. Only about 25 tons of rhodium are mined each year. Compare that to the 2,350 tonnes of gold mined in 2014. Investment interest is definitely picking up in Rhodium with investors who are finally starting to notice the market’s fundamentals have tightened markedly. Rhodium is mined as a co-product along with Platinum, Palladium and other PGMs, so output cannot easily be tweaked to match demand. 'Mine output peaked in 2007 at 824,000 oz, it dropped to 695,000 oz in 2008 when power outages in South Africa hit production (which led to the jump in prices to $10,000/oz), but rebounded to 770,000 oz in 2010, before slipping to 705,000 oz in 2013', according to Johnson Matthey data. Production in 2014 will have fallen further as a result of the strikes in South Africa. Rhodium supply has recovered, as the new three-year labour contract in South Africa should reduce the chances of labour unrest, however the country has hit very economic turbulent waters recently. Rhodium supply amounts to some 980,000 oz, including recycled material, which is about 1/12th of the size of the Platinum market. Overall, although industrial demand may not see significant levels of growth the shift into Rhodium by industrial users due to prices could place extreme pressure on supply, we expect that the combination of supply deficits and a pick-up in investment demand further exacerbating supply/demand deficits. Along with extreme pressure on mines not able to make investment in exploration and present mine expansion due to the uneconomical nature of mining at these extreme low prices of metals generally - well the investment potential in buying physical Rhodium looks to be very exciting going forward. Neither Wall Street nor the investment public is aware of rhodium and only a tiny handful of investors and institutions internationally have this extremely rare metal on their radar. Most investors and speculators have not even heard of rhodium. 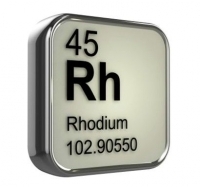 Considering the price mismatch and supply demand dynamics that are apparant at this time, rhodium is a very compelling and exciting investment for the medium term investor (2 to 5 years). Rhodium is a hard tangible asset that has very favourable supply demand fundamentals. Investors who own it stored in international vaults such as Freeport Singapore are not exposed to the current elevated financial market risks. Unlike companies, banks and governments, rhodium cannot become insolvent ! Rhodium is finite and the rarest of precious metals. In a finite planet with rapidly growing populations internationally and money printing and currency debasement on a scale not seen in modern times, rhodium is likely to at the very least preserve value in the coming years. Thus, physical rhodium more than merits an allocation within the precious metals basket of a properly diversified portfolio. Baird & Co. Mint are one in a very small group of refiners that produce a range of refined 999% proof bar products available to the general public and investment community. 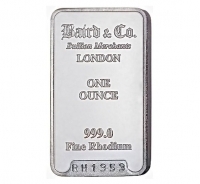 If you wish to speak to one of our staff regarding our physical rhodium bars minted to 999 % purity then feel free to call our support on +65 315 827 91 (or use our live chat system) or indeed send us an email by clicking here and ask questions on opening a storage account with us today, or simply ask for help in setting up an account.